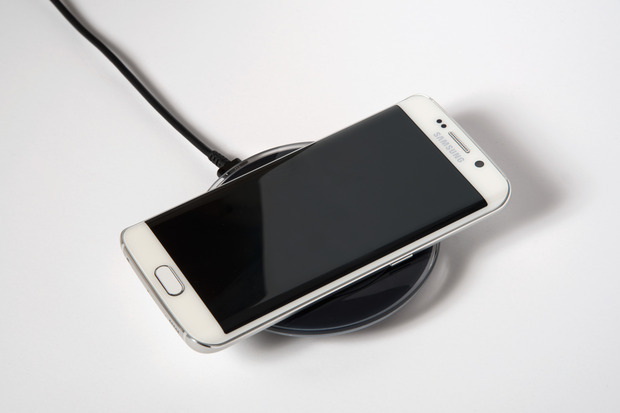 The Wireless Power Consortium (WPC) this week announced the latest version of its Qi wireless charging specification, which provides three times the amount of power as the majority of in-market Qi charging products. In fact, the new 15w WPC wireless spec offers the same amount of power as many wired charging options available today for mobile phones. One of the biggest downsides of modern wireless charging is that it takes significantly longer to power up devices than traditional, wired charging cords. However, the new Qi spec could go a long way toward closing, even eliminating, that gap. For example, Samsung’s Adaptive Fast Charging cords are some of the faster mobile phone power options available, and they provide 15w, the same amount of energy as the new Qi spec, according to John Perzow, WPC’s vice president of market development. Mobile devices need to be built to support the spec, and the majority of existing phones with wireless charging, including the two Galaxy S6 phones, will not be able to charge at the full 15w without some sort of adapter. The Galaxy S6 phones support the 5w Qi standard — in addition to the current PMA standard — and therefore will be able to charge at only 5w even if you use a 15w charger. However, the new spec is backwards compatible, according to Perzow, which means new chargers should still be able to power older devices that support Qi. Perzow also says it will be more expensive to build 15w, Qi-compatible devices, at least for a while, so companies may still choose to use the cheaper 5w or 7w specs. “You pay for power,” he says. In addition to the new specification, the WPC also released a set of the test procedures and utilities needed to verify that products are compliant, but it will still take time for manufacturers to design, test and build chargers that use new Qi spec. In fact, Perzow says it can take as long as two years to design new 15w chips or integrated circuits, though WPC members have already been working with the spec and could presumably release compatible products in the near future. Perzow says Qi products are about to flood the market; he estimates that 55 million Qi devices were in use at the end of 2014 and that 100 million more Qi gadgets will ship during 2015. WPC’s Qi is one of three leading wireless charging standards vying for the top spot in the world of wireless power. The Power Management Alliance and Rezence are also contenders, but WPC says its 15w spec is “a first in wireless charging.” Notable companies that back WPC include Belkin, HTC, IKEA, LG, Microsoft, Motorola, Nokia, Panasonic, Samsung, Sony, Texas Instruments and Verizon Wireless.